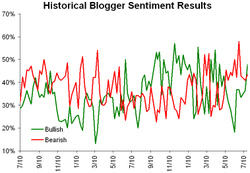 The S&P 500 energy sector is now at its theoretical low, and for oil bulls may present an opportunity. 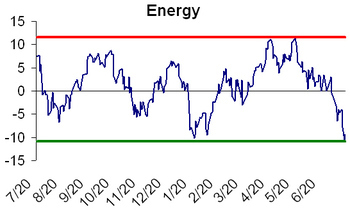 The model shown below indicates that the energy sector is the most oversold it has been in the last 18 months. As we have seen again and again with financial stocks, this does not mean that the sector cannot continue lower, and a further breakdown in oil may facilitate that, but oil bulls can expect a bounce. 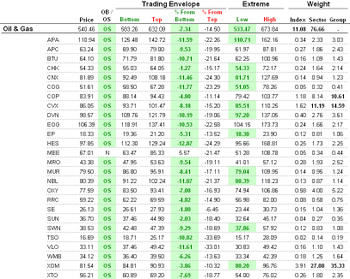 Below is a list of oversold stocks on the S&P 500 oil & gas group (click the image to enlarge). The bloggers are bullish for the first time since May. 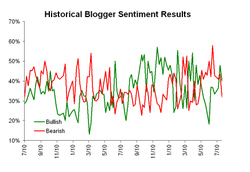 Bloggers stay bearish for July. Can second quarter earnings reports save the market? 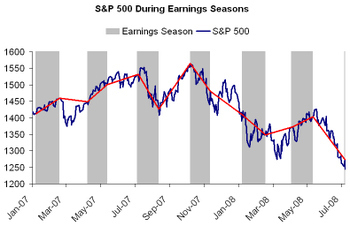 Looking at other earnings seasons the results are mixed. 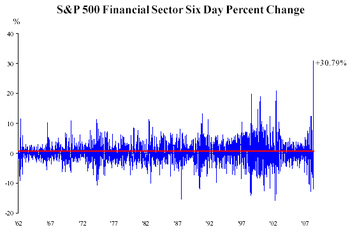 Stocks rallied 2.22% when S&P 500 companies reported their first quarter results (between AA: 4/7/08 and WMT: 5/13/08); however, during the two previous earnings seasons the market declined -4.28% and -5.37%. 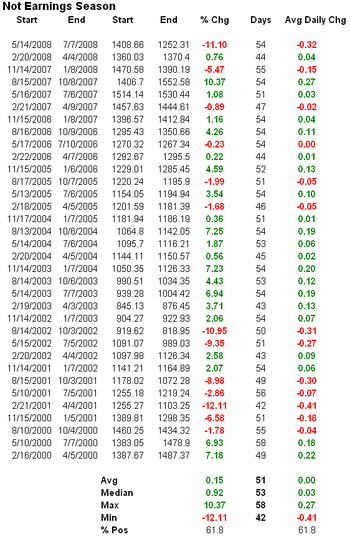 As shown in the table, Alcoa began 3Q07 reports on 10/9/07, the market top. 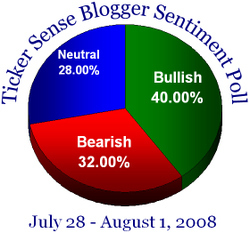 With the market on edge and earnings season upon us posts have been light recently. 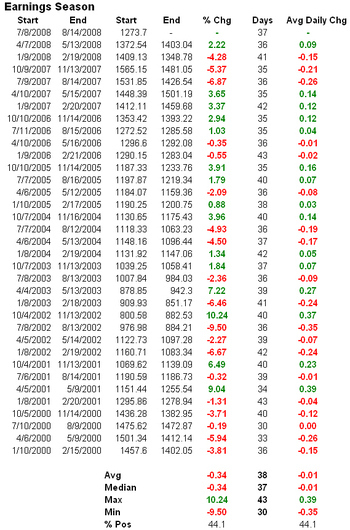 In the following chart and table we look at bear markets in the Dow Jones Industrial Average since the end of World War II (bear market being defined as a 20% decline or more from peak to trough). 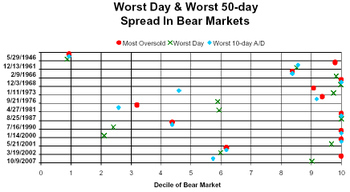 The chart below shows the duration of the decline (0 is the start and 10 is the end), and where the market was most oversold, where the worst day occurred, and where the worst 10-day A/D on the NYSE was. 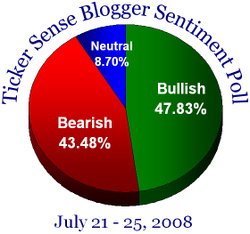 Due to the short week last week we are going to let the June 30th poll ride. 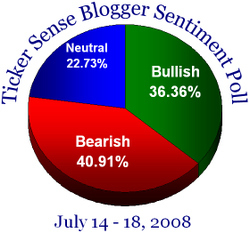 Any participants who wish to comment on the market are invited to comment.